اصلانی, علی, زمانی اشنی, جمال. (1393). بررسی تاثیر امپدانس و ضخامت لایه‌های متفاوت بر خیز لایه هدف در سیستم‌های زرهی لایه‌بندی شده تحت بارگذاری انفجاری با استفاده از روش تحلیل عددی. 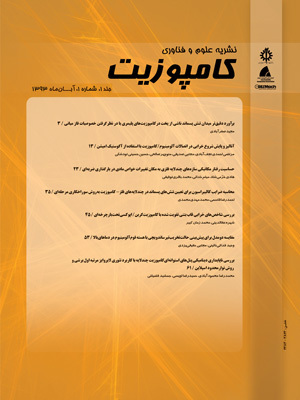 علوم و فناوری کامپوزیت, 1(2), 11-20. علی اصلانی; جمال زمانی اشنی. "بررسی تاثیر امپدانس و ضخامت لایه‌های متفاوت بر خیز لایه هدف در سیستم‌های زرهی لایه‌بندی شده تحت بارگذاری انفجاری با استفاده از روش تحلیل عددی". علوم و فناوری کامپوزیت, 1, 2, 1393, 11-20. اصلانی, علی, زمانی اشنی, جمال. (1393). 'بررسی تاثیر امپدانس و ضخامت لایه‌های متفاوت بر خیز لایه هدف در سیستم‌های زرهی لایه‌بندی شده تحت بارگذاری انفجاری با استفاده از روش تحلیل عددی', علوم و فناوری کامپوزیت, 1(2), pp. 11-20. اصلانی, علی, زمانی اشنی, جمال. بررسی تاثیر امپدانس و ضخامت لایه‌های متفاوت بر خیز لایه هدف در سیستم‌های زرهی لایه‌بندی شده تحت بارگذاری انفجاری با استفاده از روش تحلیل عددی. علوم و فناوری کامپوزیت, 1393; 1(2): 11-20. چکیده سازه‌های چند لایه به طور گسترده با هدف ایجاد ساختاری مقاوم در برابر بارگذاری دینامیک مورد استفاده قرار گرفته‌اند. رفتار سازه‌های چند لایه در نرخ کرنش بالا و تاثیر آن‌ها بر میرایی موج شوک و خیز لایه هدف مواردی هستند که در این مقاله مورد بررسی قرار گرفته‌اند. اثر ضخامت لایه‌های سرامیکی، آلومینیومی و فولادی بر خیز لایه هدف، به صورت عددی، مورد تحقیق قرار گرفته و مدل ریاضی برای خیز لایه هدف ارائه شده است. برای شبیه سازی عددی از نرم افزار LS-DYNA بهره گرفته و از مدل‌های مادی جانسون-هولمکوئیست و جانسون-کوک به ترتیب برای مدلسازی سرامیک و فلز استفاده شده است. سازه‌های ترکیبی دو لایه و سه لایه با ثابت نگه‌داشتن ضخامت کل قسمت لایه بندی شده، شبیه سازی گردیده و تاثیر آن‌ها بر میزان خیز لایه هدف مطالعه شده است. با توجه به مهم بودن فاکتور وزن در ایجاد یک سازه زرهی، برای مقایسه بهتر سازه‌های چند لایه از نسبت سفتی به وزن استفاده شده و مقایسه بین این موارد صورت پذیرفته است. نتایج نشان می‌دهد که استفاده از دو لایه سرامیک در اطراف لایه فلزی باعث افزایش نسبت سفتی به وزن سازه شده و در نتیجه کارایی سیستم زرهی را افزایش می‌دهد. در نهایت، با توجه به نتایج مراحل قبل سیستم چهار لایه متشکل از ترکیب سرامیک و فلز پیشنهاد شده است که علاوه بر داشتن کارایی بهتر در کاهش خیز لایه هدف، وزن کمتری را نیز دارد. در این سیستم از الگوی کاهشی امپدانس در لایه‌ها استفاده شده که تاثیر مثبتی بر کارایی سازه زرهی داشته است. Abstract Multi-layer structures have been widely used for producing resistant structures under dynamic loads. In this article, behavior of multi-layer structures at high strain rates, their effect on the shock wave attenuation and deflection of target layer are investigated. The effect of the thickness of SiC, Al6061 and RHA steel on deflection of target layer was investigated numerically; and mathematical modeling was applied for target layer deflection. LS-DYNA software was used for simulation. The Johnson-Cook and Johnson-Holmquist material models were used for modeling of ceramics and metals, respectively. Two-layer and three-layer composite structures with a constant total thickness of layered system were simulated and their impact on the target layer deflection were studied. Due to the importance of weight factor in creation of a multi-layer armor, for better comparison of multi-layer structures, the stiffness to weight ratio was used. The results show that using two ceramic layers around metal layer increases the stiffness to weight ratio of the structure and improves armored system performance. Consequently, a four-layer system consisting of a combination of ceramics and metals was suggested which has a less weight and better performance. In this system, a reduction pattern for acoustic impedance is used which has positive impact on the performance of armored structure. T. Børvik, M. Langseth, O. Hopperstad, K. Malo, Ballistic penetration of steel plates, International Journal of Impact Engineering, Vol. 22, No. 9, pp. 855-886, 1999. N. Gupta, V. Madhu, Normal and oblique impact of a kinetic energy projectile on mild steel plates, International journal of impact engineering, Vol. 12, No. 3, pp. 333-343, 1992. D. L. Littlefield, C. E. Anderson Jr, Y. Partom, S. J. Bless, The penetration of steel targets finite in radial extent, International journal of impact engineering, Vol. 19, No. 1, pp. 49-62, 1997. B. Sorensen, K. Kimsey, G. Silsby, D. Scheffler, T. Sherrick, W. De Rosset, High velocity penetration of steel targets, International Journal of Impact Engineering, Vol. 11, No. 1, pp. 107-119, 1991. A. Tasdemirci, I. Hall, Numerical and experimental studies of damage generation in multi-layer composite materials at high strain rates, International journal of impact engineering, Vol. 34, No. 2, pp. 189-204, 2007. Y. Gupta, J. Ding, Impact load spreading in layered materials and structures: concept and quantitative measure, International Journal of Impact Engineering, Vol. 27, No. 3, pp. 277-291, 2002. W. A. Gooch, B. Chen, M. Burkins, R. Palicka, J. J. Rubin, R. Ravichandran, Development and ballistic testing of a functionally gradient ceramic/metal applique, in Proceeding of, Trans Tech Publ, pp. 614-621. J. López-Puente, A. Arias, R. Zaera, C. Navarro, The effect of the thickness of the adhesive layer on the ballistic limit of ceramic/metal armours. An experimental and numerical study, International journal of impact engineering, Vol. 32, No. 1, pp. 321-336, 2005. B. Roeder, C. Sun, Dynamic penetration of alumina/aluminum laminates: experiments and modeling, International journal of impact engineering, Vol. 25, No. 2, pp. 169-185, 2001. Z. Zuoguang, W. Mingchao, S. Shuncheng, L. Min, S. Zhijie, Influence of panel/back thickness on impact damage behavior of alumina/aluminum armors, Journal of the European Ceramic Society, Vol. 30, No. 4, pp. 875-887, 2010. R. Mines, A one-dimensional stress wave analysis of a lightweight composite armour, Composite structures, Vol. 64, No. 1, pp. 55-62, 2004. B. Gama, Study of through-thickness wave propagation in multi-layer hybrid lightweight armor, in Proceeding of, 1998. D. Hui, P. K. Dutta, A new concept of shock mitigation by impedance-graded materials, Composites Part B: Engineering, Vol. 42, No. 8, pp. 2181-2184, 2011. J. O. Hallquist, LS-DYNA keyword user’s manual, Livermore Software Technology Corporation, 2007. D. Zhu, S. Yan, B. Li, Single-grit modeling and simulation of crack initiation and propagation in SiC grinding using maximum undeformed chip thickness, Computational Materials Science, Vol. 92, pp. 13-21, 2014. M. Takaffoli, M. Papini, Numerical simulation of solid particle impacts on Al6061-T6 Part II: Materials removal mechanisms for impact of multiple angular particles, Wear, Vol. 296, No. 1, pp. 648-655, 2012. H. Espinosa, S. Dwivedi, P. Zavattieri, G. Yuan, A numerical investigation of penetration in multilayered material/structure systems, International journal of solids and structures, Vol. 35, No. 22, pp. 2975-3001, 1998. A. Dorogoy, D. Rittel, A. Brill, A study of inclined impact in polymethylmethacrylate plates, International Journal of Impact Engineering, Vol. 37, No. 3, pp. 285-294, 2010. J. Robbins, J. Ding, Y. Gupta, Load spreading and penetration resistance of layered structures—a numerical study, International journal of impact engineering, Vol. 30, No. 6, pp. 593-615, 2004. K. Spranghers, I. Vasilakos, D. Lecompte, H. Sol, J. Vantomme, Full-field deformation measurements of aluminum plates under free air blast loading, Experimental mechanics, Vol. 52, No. 9, pp. 1371-1384, 2012. P. J. Shull, Nondestructive evaluation: theory, techniques, and applications: CRC press, 2002. J. M. L. R. Rajendran, Blast loaded plates, Elsevier, 2008. G. Nurick, G. Shave, The deformation and tearing of thin square plates subjected to impulsive loads—an experimental study, International Journal of Impact Engineering, Vol. 18, No. 1, pp. 99-116, 1996. M. Lee, Y. Yoo, Analysis of ceramic/metal armour systems, International Journal of Impact Engineering, Vol. 25, No. 9, pp. 819-829, 2001. Y. Wang, F. Wang, X. Yu, Z. Ma, J. Gao, X. Kang, Effect of interlayer on stress wave propagation in CMC/RHA multi-layered structure, Composites Science and Technology, Vol. 70, No. 12, pp. 1669-1673, 2010. Y. Wyser, C. Pelletier, J. Lange, Predicting and determining the bending stiffness of thin films and laminates, Packaging Technology and Science, Vol. 14, No. 3, pp. 97-108, 2001.